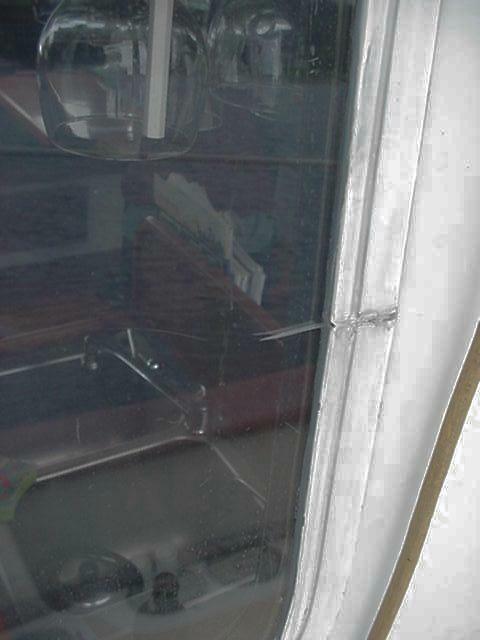 We have Doweast 45, hull #11, and like many Downeast owners were faced with deteriorating, poor quality unsafe large cabin windows. 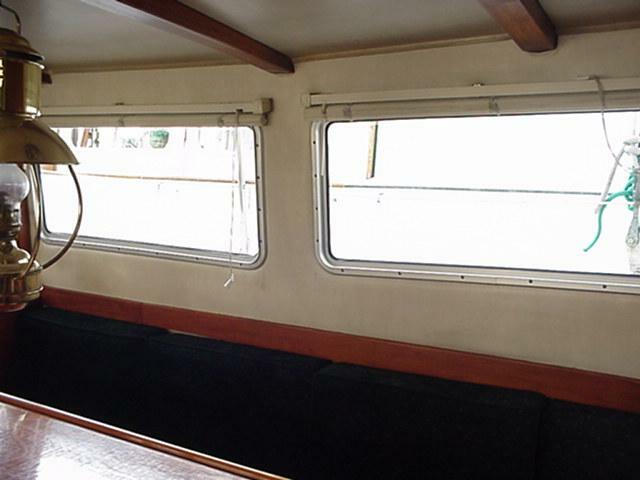 After years of procrasting (a lot) and research ( a lot also), I contacted the Canadian company Bomon www.bomon.com I made the contact only after getting a healthy endorsement from Tavarua (bigwave@emeraldoe.com), who has already made the purchase (but not yet the installation) of large windows for his boat. It was an initial report by Tavarua on the DowneastYachts web site that served as the starting point in the project for us. I can only say that Alain (the guy to talk to) is wonderful to work with. Their web site provides access to a pdf file which can be used for the order specification. They will make the windows to fit your specs exactly (really!) – not only in length and width, but also in curvature (the cabin sides are not straight, but are curved). I decided that we would have to start by measuring the raw openings. 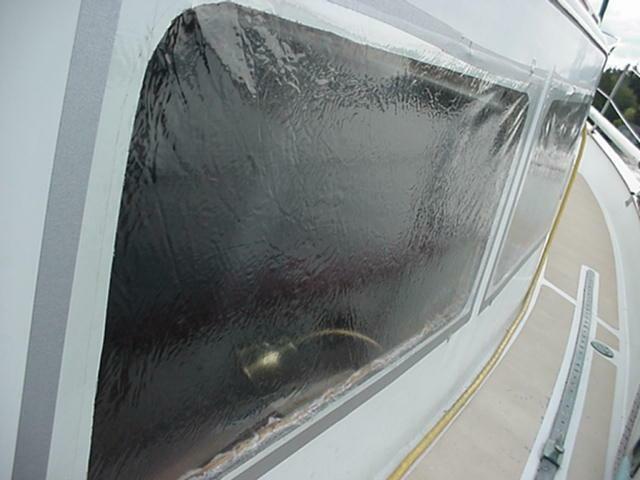 Because the extrusions had rolled rather than bent, the seal between the windows and the cabin sides has been held over the years with an ugly accumulation of silicon rubber It was time for them to go. 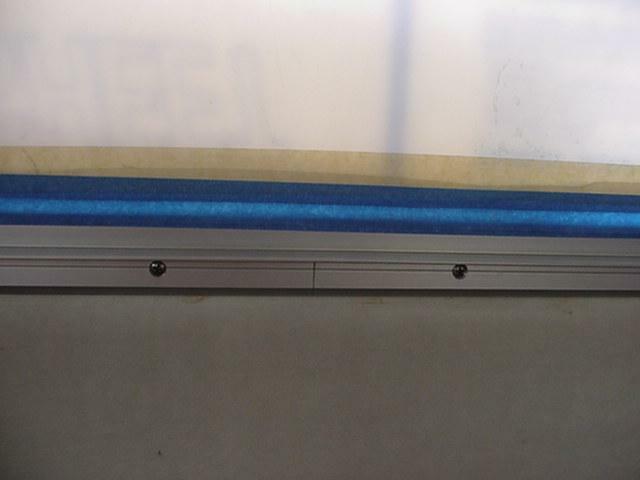 After the windows were removed, the openings were carefully measured using an aluminum straightedge, and the specs were sent to Bomon. Then the openings were covered with vinyl (really kind of translucent… we’ve lost our view pix #4), held on with long-term masking tape. Alain reviewed my drawings and sent me approval drawings of the windows as they were to be manufactured. There was a little negotiation on a couple of the curvature specs (which were different on the top and the bottom edges for some of the windows), but finally we OK’d the revised drawings. Then we waited the approximately six weeks that it took to get our windows thru the manufacturing cycle at Bomon. 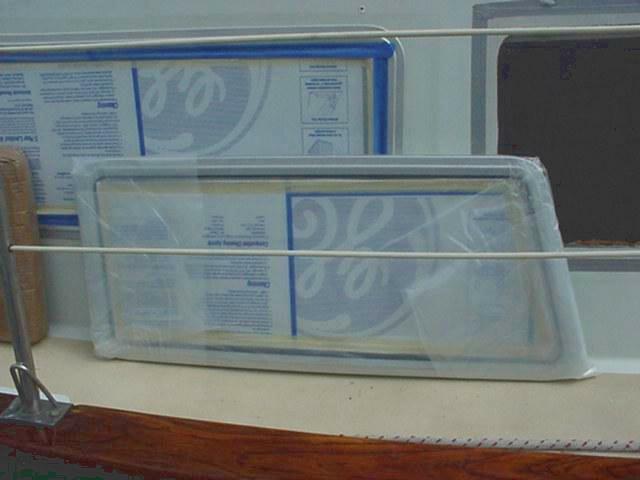 We chose to use clear anodized frames and 1/4″ Lexan glazing. 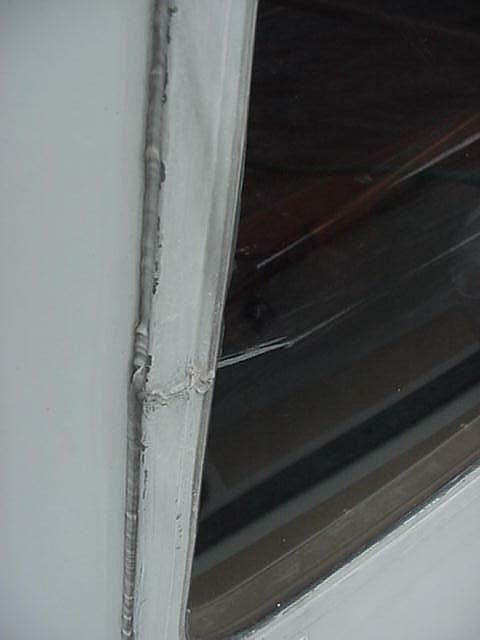 I had originally wanted to use 3/8″ glazing, but Alain recommended against it due to the amount of curvature we had. Bomon delivered on time (really!). 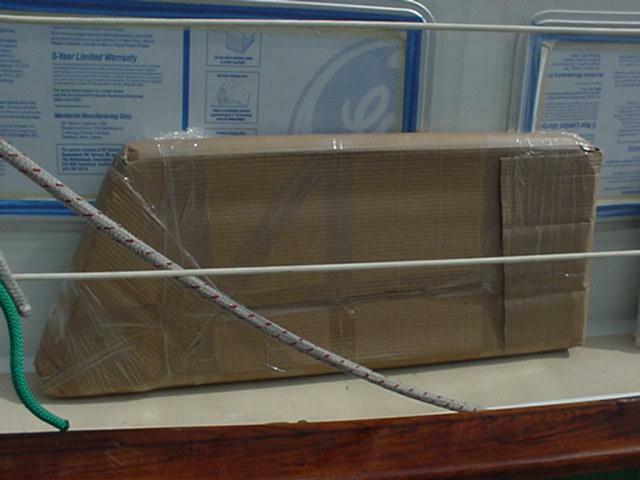 The windows were shipped in a large box with lots of padding, and each was individually wrapped with heavy polyethylene and a padded overwrap (pix 5,6). They are *very* well made – the joints between the two pieces of the internal trim/clamp ring are so tight that a piece of cigarette paper would not fit between the pieces (pix 7). I had sized the windows to meet the largest parts of the raw openings , which meant that some grinding of the irregular openings was in order. I did this using my trusty angle grinder – exactly the right tool for the job. 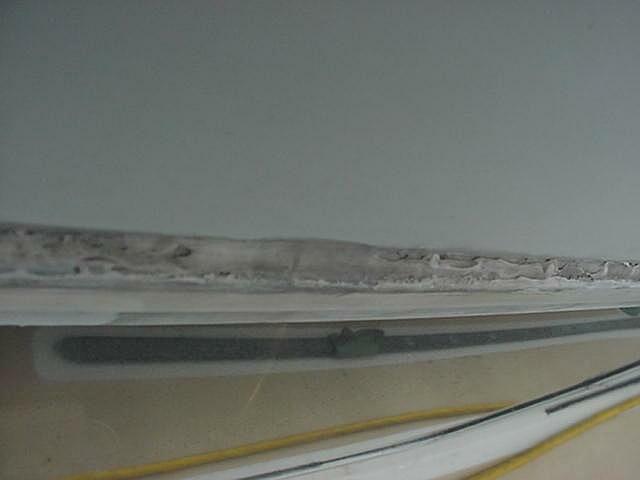 I learned very quickly that the powdered fiberglass dust went everywhere, so I recycled the poly overwrap from the new windows, taping it over the inside of the window opening while the grinding was under way. This was best done by leaving a pocket on the inside to catch the rather voluminous quantities of dust which the grinding made. Of course, removing the poly without dumping its load was kind of tricky, but doable. Alain made the windows to the opening measurements I provided… exactly. 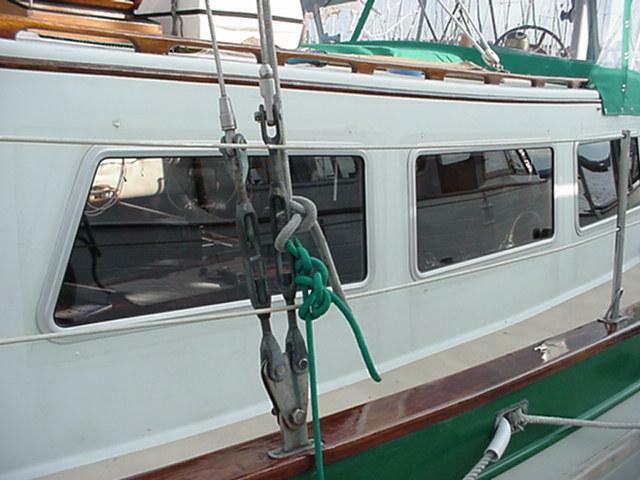 His match of the curvature of the cabin sides was wonderful – they fit tight everywhere! Well, they’re in – it took a couple of afternoons. These windows are *SOLID*. And they look GREAT (pix 8). And the anodized frames are much more attractive on the inside than the old dark brown ones were (pix 9). We could not be more pleased with the process and the results. I cannot recommend Bomon highly enough, and Alain in particular. Other than the mess from grinding, this project was much, much easier than I had anticipated.